There is a lot of responsibility when you take on the role of ‘bee farmer’ or ‘pollinator steward’. Most people are aware that honey bees are in danger and need our help to provide the plants and habitat needed for them to survive. If you eat almonds, pears, cherries, peaches or apricots, bees are instrumental in making sure those crops are productive and available to consumers. Farmers have leaned on honey bee hives placed near their fields for decades to promote pollination. Some now even plant hedgerows between fields so the pollinators have a varied diet. Orchardists have learned that clover and other low-growing, bee-loving plants seeded between fruit trees are not only beneficial to entice bees to pollinate their orchard, but also help control erosion and weeds. But what about home gardeners and community gardens? They can also do their part to encourage pollinators to visit. One of the most sought-after bees are the mason bees, or blue orchard bees (aka BOB). These small solitary bees quietly go about their business, rarely sting, have no queen and no hive. They are active in April and May in the Pacific Northwest, busily collecting pollen, laying their eggs, and sealing their colonies with clay mud. They need a nearby source of clay or mud and pollen producing plants within 300 feet. They aren’t as fussy about the weather as honey bees and will work in the rain. Mason bee lodges or nesting blocks are much more available and affordable too, as people become aware of the benefit of healthy colonies of mason bees to garden and orchard production. However, if you take on a mason bee lodge, you need to be diligent about cleaning it in the fall, and removing the cocoons and gently washing them. Mason bees are subject to two primary diseases or pests, Chalkbrood Fungus, and microscopic hairy pollen-eating mites. These affect mason bees in our area mostly as a result of our ecology (i.e. wet, damp winters). The mites infect bees and can build up over time in a colony. Chalkbrood fungus is airborne and lands on many plants. Female bees can collect poison pollen not knowing it and transport it back to the bee lodges. The larvae eat the poison pollen when they hatch from the egg. The larva is the brood stock of the bee. The larva will turn a crispy mocha brown color and die. By cleaning the colonies out every fall, the infection can be cut by 95 – 98%. There is no doubt that having a mason bee lodge in your yard is both beneficial to you and your garden, but also beneficial for supporting pollinator populations. But not everyone wants the responsibility of cleaning and sterilizing the bee colony in the fall, or hand washing bee cocoons. Enter Missy Anderson, the ‘Bee Queen’ of Bothell. Missy operates a business tailored to providing bee colonies in early spring to people throughout the Puget Sound area and then taking the lodges back in early June to clean them to help try and stop the spread of disease in the colonies. Missy began this endeavor innocently enough, raising bees for her own garden in Bothell. Realizing how much better her garden produced, she decided she needed more bees. 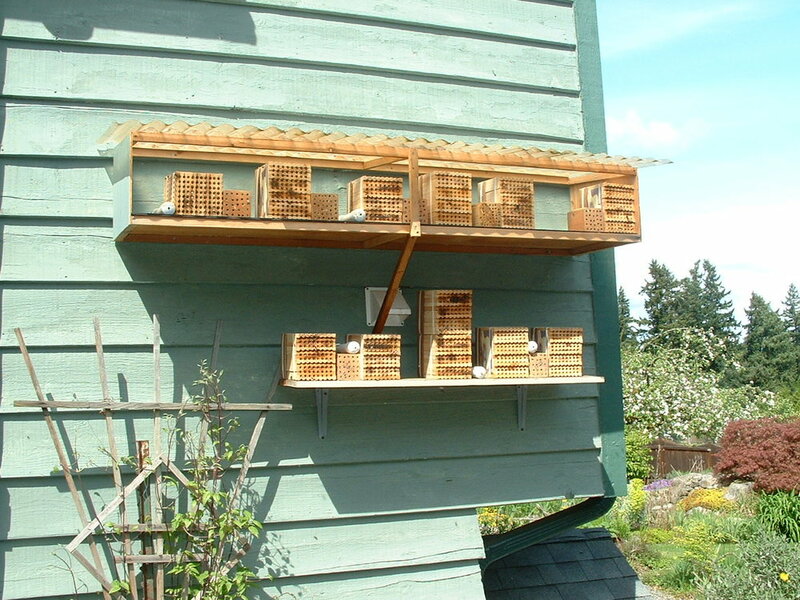 She first learned about mason bees at Seattle Tilth, when a friend invited her to tag along. In 2005, she went through the WSU Master Gardener program and was asked to speak on mason bees as part of the volunteer hours she needed to give back to the program. By then, she was giving bee kits to friends, rolling paper bee tubes endlessly (22,000 tubes one winter alone) and delivering boxes for free. A friend suggested she schedule pickups (ten minutes apart) at her house through an online program which worked for a while but became overwhelming too – Missy was retired after all! Enter Jim Watts, a large-scale producer of leaf cutter bees for commercial agriculture through his company Watts Solitary Bees (wattsbees.com) Jim also lives in Bothell but has facilities in Portland and Ontario Oregon, as well as Bothell. His warehouse distributes 70 million leaf cutter bees to producers of almonds, cherries, pears, peaches, and apricots all through the West. He took an interest in the demand for mason bees that Missy was faced with and eventually bought her business. Together, they manage ‘Rent Mason Bees’ (rentmasonbees.com) and now serves 700 customers throughout the Puget Sound area. They hope to reach 1,000 customers this spring. Research is an ongoing endeavor for Jim and his cousin Craig Watts, who is propagation manager for the company and lives in Portland. Together, they work with the USDA Ag Research facility in Wenatchee researching pollination in cherry production and with Oregon State University on another joint venture studying cherries. Farmers and orchardists are also making use of a program through APHIS (the US Department of Agriculture Animal and Plant Health Inspection Service) which provides seed to growers as a cover crop between rows. There is also bee research being conducted in Logan, Utah where Jim partners on research projects. For the rent-mason-bee project, lodges were needed to send out to customers for the season. Originally, Missy’s late husband Jim made the simple houses, but Watts has taken that over at his Bothell facility. The Watts Company used 50,000 board feet of linear lumber last year for the production of nesting blocks for the mason bees (both for commercial agriculture producers and home gardeners) and will likely use more this year. How Can You Help Mason Bees? Helping mason bees is easy and a fun activity for the whole family. According to Missy, all you need is sun + clay-based mud + bee pollen and you can become a bee farmer. Missy is so excited about her role as bee queen that she teaches classes all over Puget Sound and is working with the Girl Scouts on a patch program. Missy suggests that one of easiest ways to help pollinators is to leave dandelions, chickweed, shot weed (or spit weed), buttercups, and clover in your yard while they mature. If you can leave them at least through the end of May, that will benefit the foraging mason bees. This also gives the bees multiple sources of pollen. According to Missy, “A single nutrition element is never a good idea – have diverse bee food”. Leaf cutter bees are more active in July and August, while honey bees can range over several months. To contact Missy Anderson about speaking to your group, email her at queenbee@rentmasonbees.com. Planting natives along your stream or wetland, or anywhere on your property, provides many benefits to our natural landscape. This list helps identify native plants that can help stabilize your soil. More and more frequently now people are recognizing that people, wildlife and the environment all benefit from a landscape of native plants. To promote the use of native plants, Conservation Districts in Washington State hold native plant sales every winter. This is a great opportunity to purchase native plants and the price can’t be beat—plants are sold at wholesale cost. Read on to learn more about native plants and how they can be used to enhance your horse property. How much time and energy do you spend watering in the summer? Wouldn’t it be nice to have a drought-resilient landscape? Several choices exist for creating a beautiful yard that can withstand weather extremes, and one option is planting native plants. 2016 marks the 75th anniversary of Snohomish Conservation District. There have been so many great leaders who have championed conservation here in Snohomish County, on Camano Island, and in the Puget Sound area. Some have been recognized, others not so much. Here are a few who have worked with us, or in the area, that we'd like to recognize, along with three books which highlight the life and work of these pioneer leaders. Have you had a new farm project on the back burner that always seems to be waiting for the right moment or enough extra cash to begin? Maybe a manure bin, soil improvements or gutters and downspouts for the barn (the muddy season is fast approaching, after all). Fortunately for residents of portions of the Snohomish and Stillaguamish River watersheds, the time to begin may be now. Cover cropping builds soils health by increasing organic matter which in turn can help drainage, retain soil moisture, increase nutrient availability and reduce erosion. Ideal planting dates will vary regionally but here in the PNW many growers will seed in the coming weeks. This means that some tough decisions will need to be made concerning which cover is right for you! As luck would have it, Greg Moga, owner of a historic Snohomish valley farm, came to us. Moga is on the board of The Nature Conservancy and shortly after buying a 98-acre farm, he was referred to us by another Nature Conservancy member for tips on planting grasses that would attract birds and other wildlife.